Enter your email below to subscribe to this blog. The Robe was pink instead of white. My chubby little hands just couldn’t part with it…that luxurious pink fuzzy robe that Megan purchased at Victoria’s Secret for Mother’s Day well over a decade ago. Made from chenille, just like the bedspreads of most grandmothers, it embodied the word ‘cozy.’ Over the years it has become a relic: worn, tattered and old. It’s no secret that my daughter and I had a long-standing relationship with the national chain. I had wanted the experience of purchasing her first bra to be far different from mine…It was Day of Horror when Mom held up an industrial training bra in an anything-but-private J.C. Penney’s and yelled, “We’ll take two of these.” A touch of lace wasn’t invited to my Training Bra Party, so when Megan came of age I was quick to opt in for the private fitting appointment at Victoria’s Secret and a “Get whatever you want” attitude. It wasn’t without controversy – it was an era when a war raged against Victoria’s Secret for their scantily clad models. Mass media told me that they promoted unrealistic body images and starving models as their selling point. Yes, I want Victoria’s Secret to have corporate responsibility, and I hope they are not campaigning to child brides. 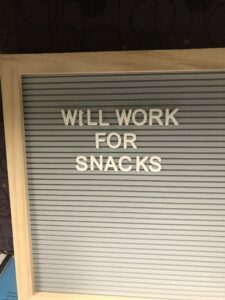 But frankly, I’m not missing any meals in an effort to look like Heidi Klum and “Will Work For Snacks” is on the letter board in my office. The hoop-la went beyond female body image issues. Those white faceless plastic mannequins in the store windows were also on trial for causing hormonal male teens to stumble down Satan’s alley. From many a pulpit there was a call to boycott. Sweet Jesus…give me a break. 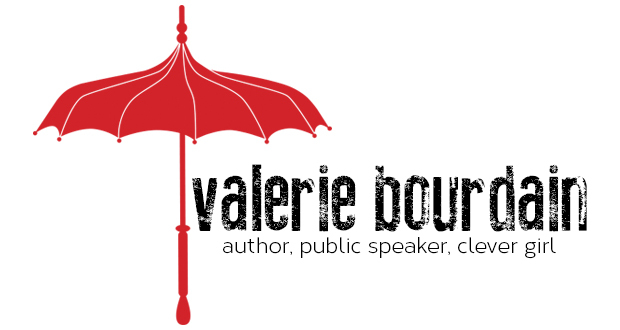 My point of view was something no male preacher ever considered: Omaha is a small town…I didn’t want some male upperclassman of Megan’s who was working his first job at Kohl’s publicly ringing up her purchase as he ogled her double D bra size. But that’s just private me. Thankfully, the experience for Megan was personal and private, with not a man in sight when we entered the store. A lovely young woman helped her, and by the end of the hour Megan had the classic pink bag in hand, and I had in my possession one smokin’ credit card. 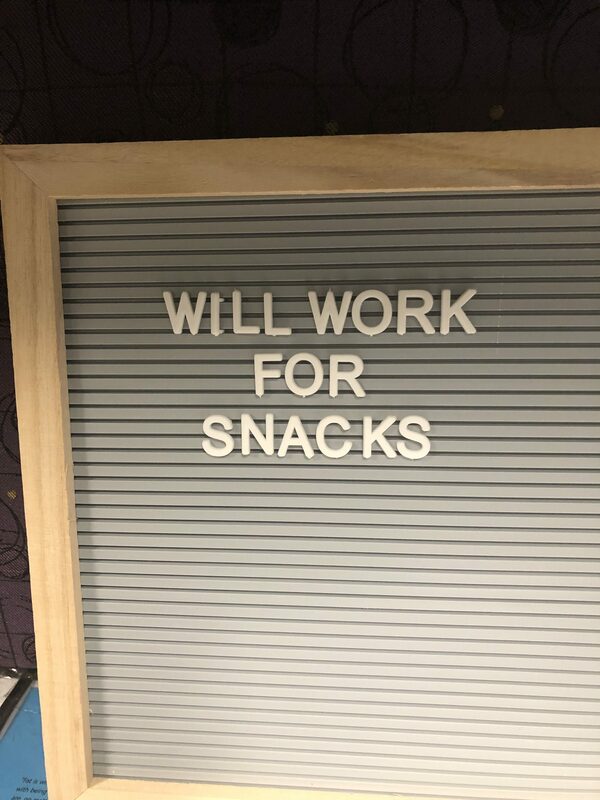 We were hooked and became regulars to the semi-annual sales. Mind you, there were mother-daughter boundaries. Since I was paying, I saw everything she bought. However, I was relegated to the other side of the store to ensure Megan never laid eyes on my pantie preferences, as though one glance at Vintage Valerie lace would blind her, Medusa head-style. Then there was the day I referred to the chain as “Vicky’s.” Megan banned me from ever uttering the “V” name because old moms shouldn’t have a nickname for the naughty underwear store. 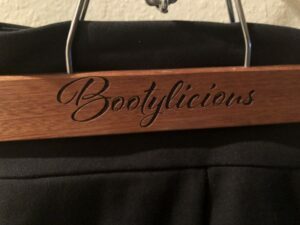 My girl was the vocabulary police and she also banned me from booty-licious and bangin’. It then became my Mom obligation to publicly use “Vicky’s” and “Booty-licious” in one streamlined sentence. The truth is, setting the Mom-irritation factor aside, the store brought us joy, which made The Robe even more special. Things transitioned, and The Robe became the mantle that I wore for forty-four months as a primary caregiver who made many a night flight across our home to our daughter who battled adrenal cancer. My pink fuzzy Super Mom cape flew me safely to her bedside where she would say the words, “Stay with me, Momoushka…I’m afraid.” The Robe would then morph into my blanket in the 4 a.m. hour. In the last five months of Megan’s life, The Robe was the only fabric that separated me from the midnight hospice nurses. I tried for a while to throw on street clothes before letting them in, but realized that the team of angels had already seen me emotionally stripped down. Clothing was irrelevant to the women who could see into my naked soul as they cared for both my daughter and my breaking heart. As Megan’s light began to dim, I left The Robe on the floor to pamper her pooches. Once she moved to Josie Harper Hospice House, the canines found familiarity in my lingering scent, unaware that I would soon become their new master. 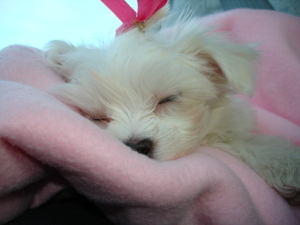 Winnie was so very little, burrowing into a ball that nervously chewed the hem of The Robe’s sleeve. How could I be mad at her four pounds of cuteness? My woobie robe was unraveling just like my life. It’s been fourteen years since that season, and for a decade I hung The Robe from a hook as a reminder of the secretly woven tapestry of my life…one that I may never understand. But there came a point that it was time to remove that which had been chewed up. 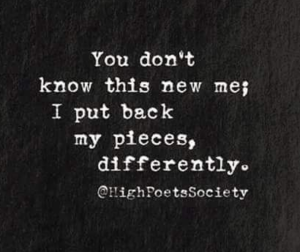 I needed to put the broken pieces of my life back together differently. After a wonderful visit, friend Linnette took The Robe to a seamstress in Los Angeles who thoughtfully removed any damage, preserving the fluffy pink hearts. The Robe became two pillows that are the new accessory to my dog named Pugsley [aka The Little Monster] who builds a lap of luxury the minute I’m out the door to work. I know he drags the pillows formerly know as The Robe in his slobbery mouth to the foundational layer of his throne for the day. 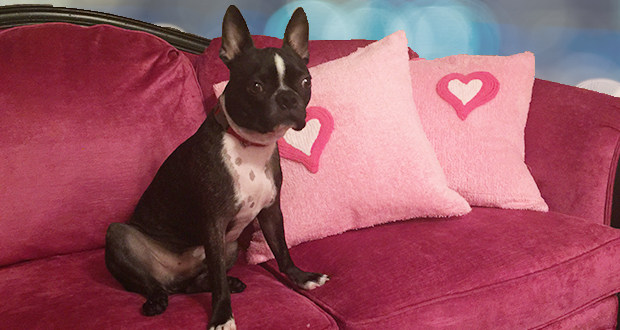 If these pillows could talk they would remind me that it’s not their first encounter with a set of chops. I could buy pillows that are new and nicer. But when I come in after a long day of work they remind me that even broken hearts can be made whole again. Remembering you, dear Megan, on this eleventh anniversary of your death, and missing our favorite shopping experience. It was Megan who taught me, “Feel beautiful from the inside out…” Even though undergarments are not on display, Megan believed everything a woman wears should be pristine. “The Victoria’s Secret Catalog Never Stops Coming” is an all time favorite book about cancer. Every single time I’ve been to Vicky’s there is at least one woman in hijab making a purchase. Privacy matters. 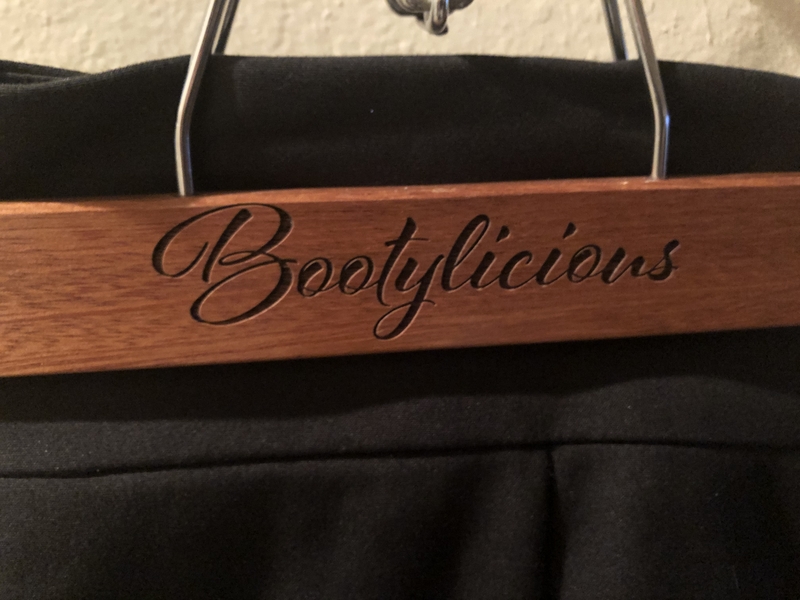 I have “bootylicious” engraved on my skirt hangers. I just love to read your blog entries! Never miss them!! Loved your words! My heart is with you on this anniversary. 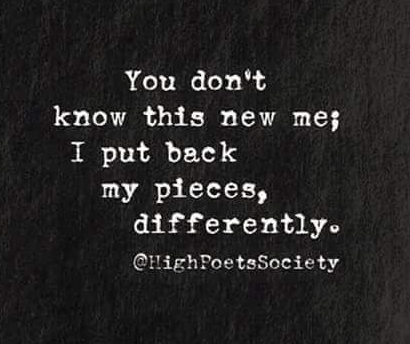 Interesting as I was reading this, your quote came to my mind as I had just sent it to a friend this morning who is recovering from a bad divorce. I keep reading your story and there was that quote! It is so true. How do you do it? Your vulnerability is so endearing and beautiful. Thank you for putting parts of your heart down in words. I believe it’s a gift that came after Megan died. I work at it….but when I finish most pieces I see a magic element that surely comes from the God who created the Word.